What to Consider When Picking Tees? What Tees do the Pros Use? Okay – so this probably isn’t the most exciting topic you can think of related to the game of golf. For many golfers, tees are something you pick up for free in the pro shop just before heading out to start your round. Or, if you forget to do that, you might even be able to find a few by wandering around the tee box while your friends are hitting their shots. Basically, tees are something that most players don’t even give a second thought. However, just like everything else in this game, there is a lot to be said for paying attention to detail. If you are willing to invest a little bit of time and effort into learning about golf tees, you just might be able to find a bit of an edge over the competition. By far, the most important factor to consider when picking up some tees is the height of the tees themselves. You need to be sure that the tees you have in your pocket are at least tall enough to accommodate the ball placement you wish to use for your driver. You can always make a tee shorter by pushing it down into the ground, but you can’t do anything out on the course to make a tee longer – so make sure yours are long enough to begin with. For most golfers, the ideal tee height when hitting a driver will place the ball halfway above the top line of the driver at address. In other words, when you set up to hit your tee shots, approximately half of the ball should be above the top of the club. This might look a little high to some amateur players, but it will provide you with the room you need to hit up through the shot. Hitting up on your driver is a key to maximizing distance, so be sure to tee up your drives at the proper height each and every time. In terms of performance, there is little difference between wooden and plastic tees. This choice largely comes down to personal preference. One of the things that is nice about using a plastic tee is the fact that a well-built plastic tee should be able to hold up to quite a punishment without breaking. As you know, wood tees break frequently, meaning you will have to replace them as you play. 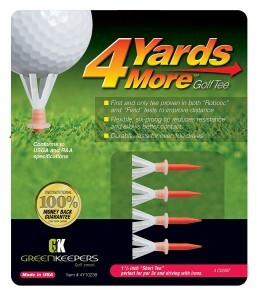 With a plastic tee, you might be able to use just one or two for an entire round. Some golf tees are marketed as distance tees that can add yardage to your drives by reducing friction at impact. Rather than holding the ball on top of a wooden peg, these tees use all kinds of various designs in order to take some of the friction away when the club meets the ball. Do they work? Well, that is up for you to decide. However, it should be noted that they are still allowed under the rules of golf, which should be considered a sign that they don’t actually offer a huge advantage. When thinking about maximizing distance through the use of a specific tee, it is your tee height that is going to play the biggest role. Some pro golfers pay as little attention to the tees they use as their amateur counterparts. Other pros, however, use high-tech plastic tees that they feel give them some form of advantage. Overall, there is no consensus among the pros as to which tees are best for optimizing performance on the course. If you would like to buy some specialty tees with the goal of helping improve your play, please feel free to check out the five options listed below. This first product on our list is a relatively traditional tee. These are 3 ¼’’ long, meaning you should have no trouble teeing the ball up plenty high – even for a large driver head. You will only have to pay a few dollars for a package of these tees, and they have graphics on them which you can use for reference when trying to tee the ball at just the right height before each swing. 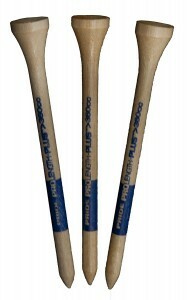 If you are looking for a standard, basic golf tee, this product will fit the bill just right. 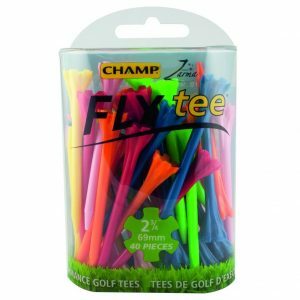 Champ is a noted provider of golf accessories, and this offering is a package of 30 2 ¾’’ plastic tees. These tees offer longer distance through reduced friction, and they also claim to help take sidespin away as well. The pronged design of the tee head may also make it easier to place the ball on the tee as you prepare to hit your shot. 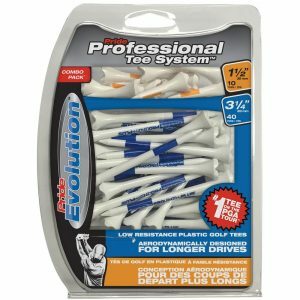 This next package of plastic tees comes from Pride Professional Tee System. There are actually two different tee lengths included with your purchase of this system – 3 ¼’’ tees, along with short 1 ½’’ tees meant for use when hitting iron shots. The color of the tee will indicate its length for you, so you can quickly grab the right one out of your pocket when it is your turn to hit. The Martini Tee – so named because of the shape of the head of the tee – is another product offering to help you achieve better performance with your drives. These are some of the most expensive tees on the market, as you will need to pay right around $1 per tee. 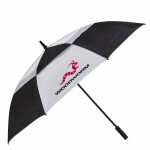 This product does conform to the rules of golf, and they are offered in a variety of colors. Closing up our list, this option from Greenkeepers features a six-prong tee head that uses a flexible plastic material to support the ball. The makers of this tee claim that less resistance will be created at impact, and therefore your drives will travel farther down the fairway. 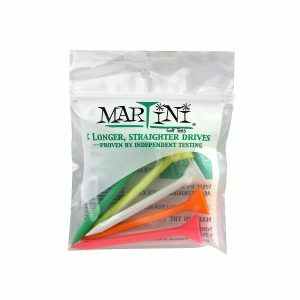 There are a number of different tee heights to pick from, and these are a similar price to the Martini Tees listed above. Again, as with the other options we listed, these tees do conform to USGA and R&A rules.